President Muhammadu Buhari, yesterday, apologised to Nigerians over the persistent and biting fuel scarcity in the country and attributed the problem to market speculators and stakeholders who are resistant to change. He assured that the government was working hard to end the shortages urgently. 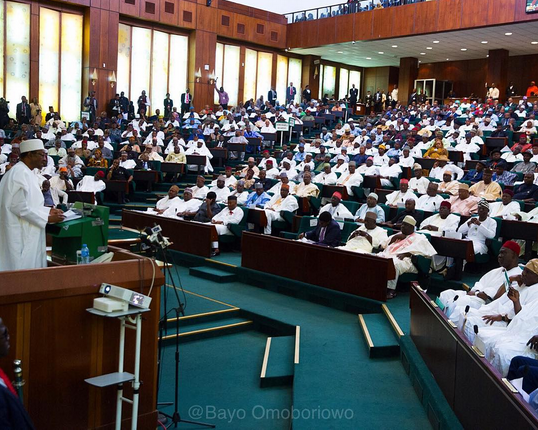 President Buhari who begged Nigerians while presenting the N6.08 trillion 2016 budget to a joint session of the National Assembly, said the government has not increased fuel price and that the pump price of fuel remains N87 per litre. 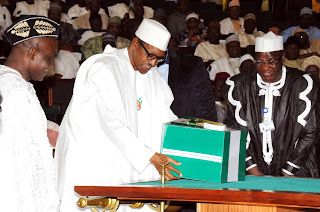 The President who started his address at 10.17am and ended it at 10.51 am, disclosed that 30 per cent of Nigeria’s annual budget will be committed to capital expenditure, even as he raised Capital Expenditure from N557 billion in 2015 to N1.8 trillion in the 2016 budget. Having reviewed the trends in the global oil industry, he said the government decided to set a benchmark price of $38 per barrel and a production estimate of 2.2 million barrels per day for 2016, with plans to focus on non-oil revenues by broadening the tax base and improving the effectiveness of revenue collecting agencies. The government is projecting to realise N1.4 trillion as non-oil revenue. President Buhari, who noted that the present administration projected a revenue target of N3.86 trillion for 2016 and recurrent expenditure of N2.43 trillion, said that the Federal Government also proposed to spend N1.66 trillion on foreign and domestic debt servicing. The President also declared that his administration would fight corruption no matter how long it takes. In the budget, there is a projected foreign and domestic borrowing of N900 billion and N986 billion respectively. On recurrent sectoral allocations, Education received the highest recurrent vote of N369 billion; followed by Health, N296 billion; Defence, N294 billion; Ministry of Interior, N245 billion while the merged ministries of Power, Works and Housing received budgetary allocation of N433 billion for 2016. The speech read in part: “The Budget was based on a benchmark oil price of $53 per barrel, oil production of 2.28 million barrels per day and an exchange rate of N190 to the US$. “The projected revenue was N3.45 trillion, with an outlay of N4.49 trillion, implying a deficit of N1.04 trillion. Due largely to under-provisioning by the previous administration for fuel subsidy and the costs required to support the military operations in the North East, the Government had to obtain National Assembly’s approval for a supplementary budget of N575.5 billion. I take this opportunity to thank all members of the National Assembly for the prompt passage of that Bill. “To deliver our development objectives, we have increased the capital expenditure portion of the budget from N557 billion in the 2015 budget to N1.8 trillion, in the 2016 budget. Distinguished and honourable members of the National Assembly, for the first time in many years, capital expenditure will represent 30 per cent of our total budget. In future years, we intend to raise the percentage allocation for capital expenditure. “This is a fulfillment of our promise to align expenditure to our long-term objectives, and a sign of government’s commitment to sustainable development. This increased capital expenditure commits significant resources to critical sectors such as Works, Power and Housing – N433.4 billion; Transport – N202 billion; Special Intervention Programs – N200 billion; Defence – N134.6 billion; and Interior – N145.3 billion. These investments in infrastructure and security are meant to support our reforms in the Agriculture, Solid Minerals and other core job creating sectors of our economy. “We will invest to safeguard lives and property. We will invest in equipping our farmers with the right tools, technology and techniques. We will invest in empowering and enabling our miners to operate in a safe, secure and humane environment. We will invest in training our youths, through the revival of our technical and vocational institutions, to ensure they are competent enough to seize the opportunities that will arise from this economic revival. “Indeed, the future looks bright. And I ask that we all work together to make this vision a reality. The 223 per cent year on year growth in capital expenditure demonstrates our desire to make Nigeria more competitive, and start the journey to deliver sustainable development in our country. “In fulfillment of our promise to run a lean government, we have proposed a nine per cent reduction in non-debt recurrent expenditure, from N2.59 trillion in the 2015 Budget to N2.35 trillion in 2016. Furthermore, we have budgeted N300 billion for Special Intervention Programmes, which takes the total amount for non-debt recurrent expenditure to N2.65 trillion. “The Efficiency Unit set up by this Administration together with effective implementation of GIFMIS and IPPIS will drive a reduction of overheads by at least seven per cent, personnel costs by eight per cent and other service wide votes by 19 per cent. Distinguished and honourable members, this budget will be executed to provide optimum value by ensuring every naira spent by this Government, counts. “We will devote a significant portion of our recurrent expenditure to institutions that provide critical government services. We will spend N369.6 billion in Education; N294.5 billion in Defence; N221.7 billion in Health and N145.3 billion in the Ministry of Interior. This will ensure our teachers, armed forces personnel, doctors, nurses, police men, fire fighters, prison service officers and many more critical service providers are paid competitively and on time. President Buhari assured Nigerians that his administration was poised to rebuilding the economy and restoring public confidence in the government. He said although the nation has series of problems to contend with, the challenges were not beyond the country to tackle, adding that the 2016 budget was designed to stimulate the economy and make it more competitive, while focusing on infrastructural development; delivering inclusive growth and prioritizing the welfare of Nigerians. Buhari also assured that the budget would address problems associated with youth unemployment and general poverty in the land, with particular emphasis on the deplorable conditions of most vulnerable Nigerians, adding, “I know the state of our economy is a source of concern for many. This has been further worsened by the unbridled corruption and security challenges we have faced in the last few years. “From those who have lost their jobs, to those young people who have never had a job, to the people in the North East whose families and businesses were destroyed by insurgents, this has been a difficult period in our nation’s history, lessons that we must not forget or ignore, as we plan for the future. “By June 2014, oil prices averaged $112 per barrel. But as at today, the price is under $39 per barrel. This huge decline is having a painful effect on our economy. Consumption has declined at all levels. In both the private and public sectors, employers have struggled to meet their salary and other employee related obligations. The small business owners and traders have been particularly hard hit by this state of affairs. “Fellow Nigerians, the confidence of many might be shaken. However, I stand before you today promising that we will secure our country, rebuild our economy, and make the Federal Republic of Nigeria stronger than it has ever been. “The answers to our problems are not beyond us. They exist on our farmlands; our corporations; in the universities in the hearts and minds of our entrepreneurs; through the gallantry of our Armed Forces; and the resolute spirit of Nigerians, especially the youth, who have refused to give up despite all the obstacles confronting them. “This Budget proposal, the first by our Government, seeks to stimulate the economy, making it more competitive by focusing on infrastructural development; delivering inclusive growth; and prioritizing the welfare of Nigerians. “We believe that this budget, while helping industry, commerce and investment to pick up, will as a matter of urgency, address the immediate problems of youth unemployment and the terrible living conditions of the extremely poor and vulnerable Nigerians”. The President who reiterated that the administration would diversify the economy through import substitution and export promotion, said that such economic strategy would build resilience in the economy and guarantee that the contemporary challenges did not confront the nation’s future generations, adding, “In the medium to longer term, we remain committed to economic diversification through import substitution and export promotion. This will build resilience in our economy. It will guarantee that the problems we have today, will not confront our children and their children. This shall be our legacy for generations to come”, he stated. According to him, despite the general global economic downturn in 2015, Nigerian economy was able to grow by 2.84 per cent in the subsisting fiscal year, just as he promised that the present administration would continue to evolve and implement strategies that would maintain micro-economic stability, while managing the oil price shocks currently aching the country. President Buhari was accompanied by All Progressives Congress, APC National Chairman, Chief John Odigie- Oyegun; his ministers including Rotimi Amaechi; Senator Chris Ngige; Senator Udoma Udo Udoma; Dr. Kayode Fayemi; Chief Audu Ogbeh; Ogbonnaya Onu; Dr. Osagie Ehanire; Lt.Gen. Abduulrahman Dambazau; Alhaji Lai Mohammed; Amina Ibrahim Mohammed; Babatunde Raji Fashola; Dr. Emmanuel Ibe Kachikwu; Abubakar Malami, SAN; Senator Aisha Jummai Alhassan; and Mrs Kemi Adeosun among others. During his presentation, President Buhari got encomiums from the gallery as they clapped 20 times and even when the President paused to drink water at 10.36am, the audience also clapped for him.